www.metro-greens.in aims at inspiring the gardener within people, to encourage them to take up gardening - enjoying the sheer joy and pleasure of sowing a seed, watching it germinate and grow over the time, and ultimately witness the charm of flowering/fruiting. Plants do not grow merely to satisfy ambitions or to fulfill good intentions. They thrive because someone expended effort on them. A record making feat (probably)! Just while browsing the internet, I stumbled upon an article of a newspaper The HINDU. The article talked about a person, Mr. Madan Gopal Kohli, a passionate gardening enthusiast, who practices terrace gardening at the rooftop of his home in North Delhi. His efforts over the past 29 years have also fetched him four recognitions from the Limca Book of Records. 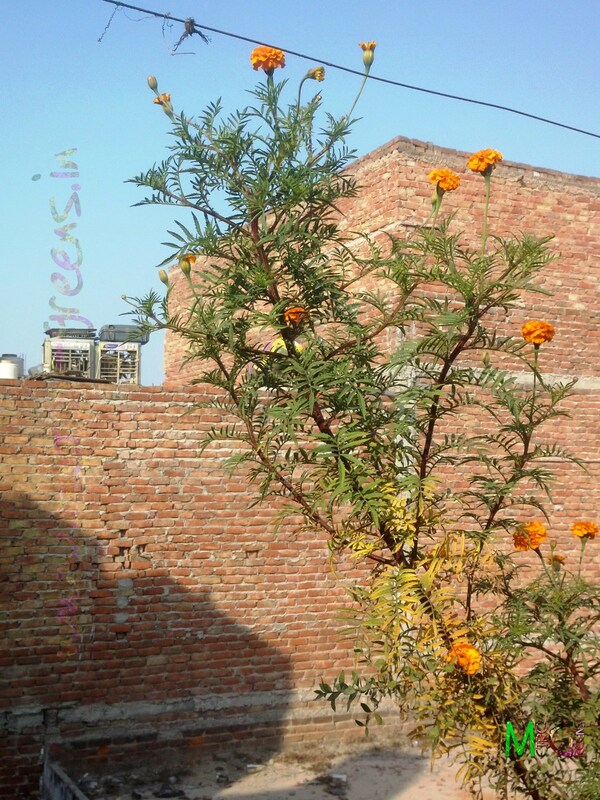 In 2008 a two-year-mint (pudina) plant hanging from a pot had reached a length of 2.18 metres; then in 2010 he grew the tallest marigold plant in his terrace garden to a height of 1.96 metres and only this year a cosmos planted by him in April 2011 in a pot reached a height of six feet. Mr. Kohli holds a record entry in the Limca Book of Records for growing the tallest marigold plant (probably potted), in his terrace garden, reaching a height of 1.96 metres. Thus, just struck me to check out the other records for such a feat, and what I found were more World Records for tallest marigold plants, one held by Rebecca Shanks, from Ohio, United States, who grew a marigold plant standing at 10.1 feets (3.07 meters), but probably in soil. To my astonishment, I have been having, under my belly, a probable record making feat for the tallest potted marigold plant. I ran up to the terrace to check the height of the plant I'm having for around a year now. While Mr. Kohli's marigold plant was 1.96 meters, the one in my pot which, I measured with a measuring tape recorded a height of at least 82 inches (2.08 meters). I measured it from the soil surface of the pot, to the top bloom, so, probably, it'll reach a height more than what I measured, had I considered the roots as well. Though, my 3 year effort is no match to Mr. Kohli's 30+ year effort as of writing this post, and I salute his continued enthusiasm to see greenery on his terrace, which has continued for so long. A shot of the marigold plant, captured around three months back, just when it started blooming. The small sensor of my cellphone camera wasn't enough to capture the entire plant in one shot, so, I had to content with just parts of the plant. While I knew that this is something extraordinary, I never gave it such an importance for I never pondered over such a record. Though, I mentioned this in one of my previous posts, that I published about 2-3 months back, as at that time, when I measured the plant, it was around 74 inches, ~1.88 meters. Now, we are planning to go in for challenging the current record, which, will most probably need some extensive research about the current records to check whether I'll be able to break the current record or not. I've shares some shots of this plant with you all. Will try taking some measurements again to ascertain the exact height of the plant, and then will try to go in to challenge the record, if possible. 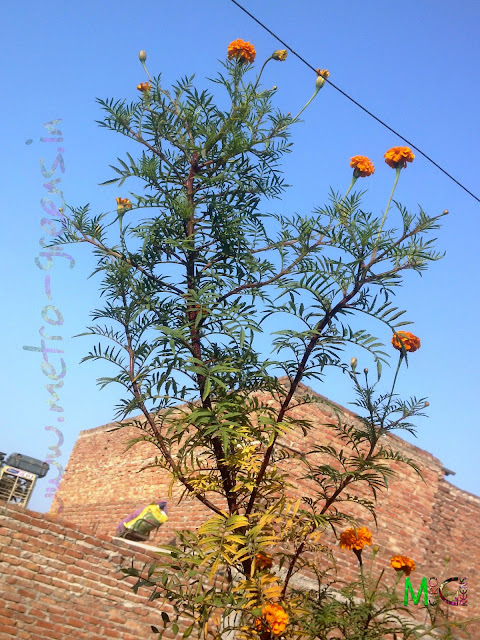 A shot of the marigold plant, captured just a few days back. It seems like it's on it's way down its life cycle, as most of the branches it had throughout its stem have died out, leaving a long 5.5 feet bare stem with a bunch of stems towards the top and a couple of marigold blooms, to keep it looking appealing. I captured this shot with a Point & Shoot Camera that I had arranged. I'll be back with some updates on this and some more winter blooms from the seasonal plants that I've got planted on my rooftop. Till then, keep visiting and HAPPY GARDENING! Outstanding! Did you save any seeds? Hello! Thanks for your comments! Be sure to check out again for updates and new content. Have Queries? I'll be happy to help! © 2013-2019 All rights Reserved. Metro Greens. Powered by Blogger.